TRENDnet Fully managed (Layer 2) Switches, It's Layer 2 (the Data Link layer) that most switches look when deciding how to move packets around a network. It's here, for instance, that a switch can find the Media Access Control or MAC address of both sending and receiving devices. Because Layer 2 information is easily retrieved, packets can be forwarded (switched) very quickly, typically, at the wire speed of the network. Layer 2 switching, therefore, has little or no impact on network performance or bandwidth. 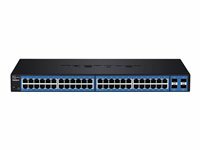 TRENDnet’s 48-Port Gigabit PoE+ Managed Layer 2 Switch with 4 shared SFP slots, model TL2-PG484, has 24 x Gigabit PoE+ ports, 24 x Gigabit ports, and 4 x shared SFP slots, a console port, a PoE Power budget of 370 Watts, and an advanced Layer 2 management feature set. 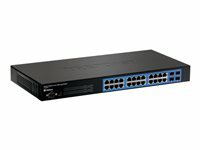 This IPv6 ready switch offers traffic management, troubleshooting, access control, and monitoring features. 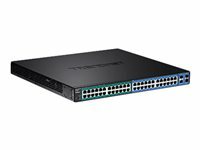 TRENDnet’s 24-Port Gigabit Managed Layer 2 Switch, model TL2-G244, has 24 x Gigabit ports, 4 x shared SFP slots, a console port, and an advanced Layer 2 management feature set. This IPv6 ready switch offers traffic management, troubleshooting, access control, and monitoring features needed to build a SMB network. TRENDnet’s 48-Port Gigabit Managed Layer 2 Switch, model TL2-G448, has 48 x Gigabit ports, 4 x shared SFP slots, a console port, and an advanced Layer 2 management feature set. This IPv6 ready switch offers traffic management, troubleshooting, access control, and monitoring features.